Back in Nerf land once again, and we're happy to revisit the Modulus range of blasters. Designed to be customisable and compatible with many different kinds of accessories, the latest in the range is a curious wee thing that can also be purchased alongside two additional parts intended for it. We check out the Nerf Modulus Mediator blaster. Unlike the Modulus Tri-Strike, and also the Modulus Regulator, the Mediator does not come with other parts like a stock or barrel adaptor. This is a small(ish) stand-alone blaster that comes with a single six-dart clip and six white Modulus darts. Not many, but the other interesting thing to note about the blaster is that the clip loads from the left side, not the underside as is traditional. This makes it an unusual shape, but it does mean that compact form can fit a pump-action cocking mechanism. As you might expect, you load your clip into the side (it's compatible with all other N-Strike clips and magazines), pump the grip, and you're ready to shoot. This is a springer blaster, so no need for expensive batteries. And, because of the small size and light weight, you can quickly zip around and blast away to your heart's content. 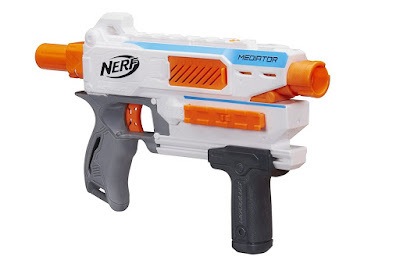 So, as small blasters go, the Nerf Modulus Mediator is very handy. But, as we said above, there are two other Mediator products available to buy which can be added to the core blaster to make it... not so small. Nerf were kind enough to send us one of them, the Firepower Upgrade barrel extension. It's worth remembering that both of these add-ons are compatible with other N-Strike blasters, so you could always buy one or both for your existing favourite Nerf gun. This has been designed to attach to the Mediator's barrel, but also function as a stand-alone blaster in it's own right. 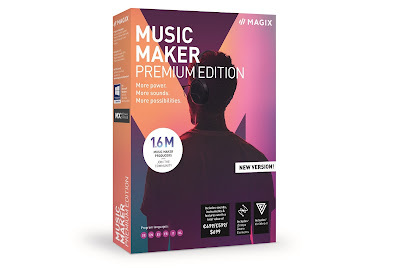 But... it's rubbish. Not as a barrel attachment, but as a blaster by itself. You see, this is also a pump-action gun, one you pump up several times to create air pressure, then hit a single button to fire three darts at once. That makes it a one-shot, shotgun-like thing, which although works very well, Nerf have chosen to but the fire button in a difficult to reach spot when in stand-alone mode. Plus, as it is a just a single-shot affair, you really wouldn't want to go into a Nerf fight with just that. That said, in barrel mode it was okay, extending the barrel of the Mediator (and therefore potentially increasing the blaster's accuracy), while adding a last-resort, close-quarters, quick-fire blast to the gun. It's fun, but for all that bulk we're not too sure it would be worth it. Still, if you like shot-gun type blasters, you might like this. Meanwhile, the Firepower Upgrade shoulder stock features a pull-out pistol, which seems to be far handier than the bulky barrel. 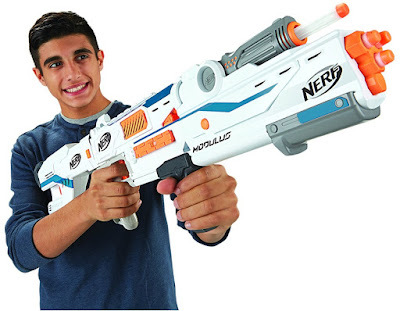 The stock also works as a normal shoulder stock; something the two-handed Nerf Modulus Mediator seems to benefit from. But, as we said, you can both one, both, or none at all. During testing, the Mediator performed very well - better than we expected a compact springer like this to shoot. After firing several hundred times (we swapped out the six-dart clip for the big 25-dart drum from the Hyperfire) we never experienced a single jam, and had pretty decent accuracy within 30 feet or so. We found that the accuracy soon decreased with ranges up to about 60 feet, but that is pretty good for something you might only be using as a secondary blaster. 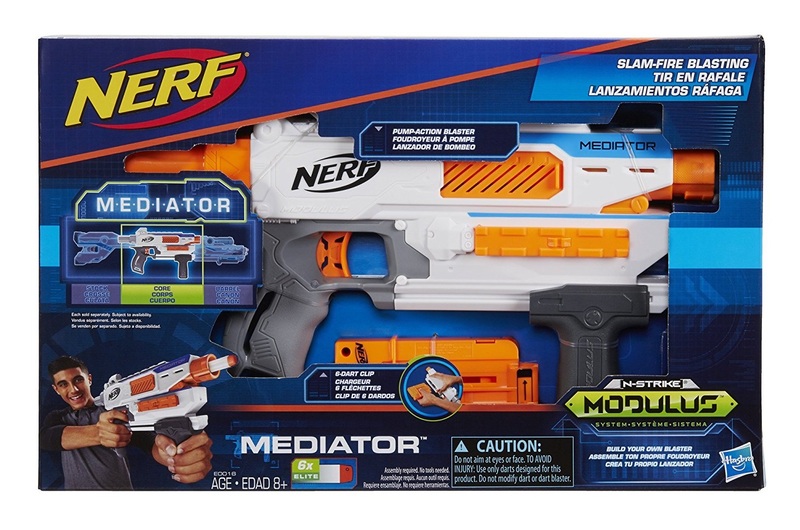 So we might not be able to recommend the additional attachments, but we do quite like the Nerf Modulus Mediator itself. If you're playing a Nerf game with lots of running around and you need something light, this could be for you.